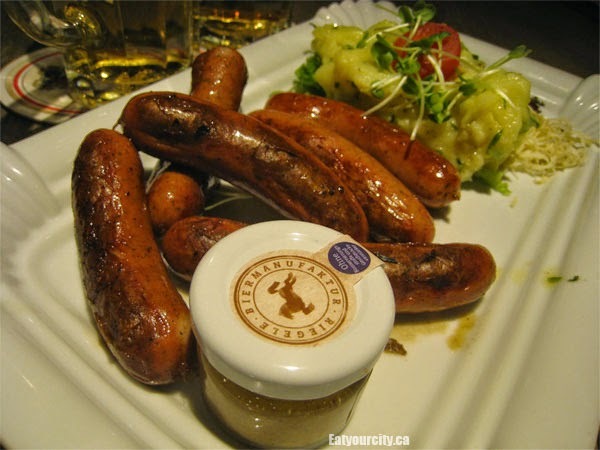 Eat Your City: Augsburg, Germany part 2: Riegele Wirsthaus Beir and Speisen, delicious beer, sausage and gestacheltes bock - a heated rod in beer for a delicious treat! Augsburg, Germany part 2: Riegele Wirsthaus Beir and Speisen, delicious beer, sausage and gestacheltes bock - a heated rod in beer for a delicious treat! Posted by After a fun day seeing the sights in Augsburg and a quick trip to Germany's Legoland in Günzburg (see post here), we headed over to Riegele Wirsthaus Beir and Speisen for locally brewed delicious beer, sausage and gestacheltes bock - a heated rod in beer for a delicious treat! Established in 1386, this brewery originally called the Golden Horse was purchased and renamed in 1884 and now is the largest private brewery in Augsburg and is still family owned... going on into the fifth generation! We arrived pretty late back in the city, so unfortunately missed out on taking a brewery tour (which you have to pre-register online in anycase), so we had our beer tasting inside the restaurant instead! :D The restaurant prides itself in incorporating their excellent beer into the menu, as well as using locally sources ingredients from local farmers and companies: Augsburg honey beekeepers, Bavaria and Swabia pork veal (and from the alpine uplands), venision and wild boar from local hunters, sausages from butcher Holnurder from Micsach, trout and char from Endhard fish farm in Dickelsmoor, fats and oils from Saumweber Munich, ice cream from Uli von Bockserg's Farm, and mustard from Secherei Spateneder, Reut in Niederbayern! And yes, we totally asked for the English menus lol! There were plenty of award winning beers to choose from, so we had a few pints to taste a selection of them. Most were available on tap and a few others like Festbeirs (seasonal specialty beers usually brewed just for occasions like Oktoberfest = Oktoberfestbier!) were bottled. Augsburger Herren Pils made with Hallertauer aromatic hops and Reigele Feines Urhell, light golden color with light scent and fine bubbles along with a Commerzienrat Riegele Privat - spicy Festbeir made with complex spelt separation and Riegele malt mash gives it a nice balance of hops, malt and smooth velvety sip-ability! 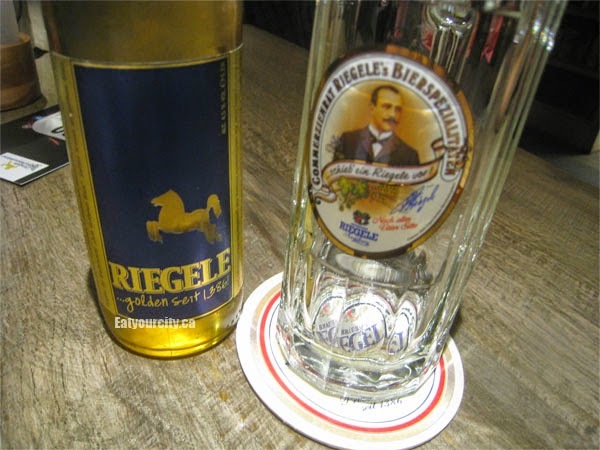 Also tried a Reigele Gold - same recipe since 1386 with lots of bubbles and bitter notes from Hersbrucker and Cascade aromatic hops, Steffi malt and Riegele's triple mash process. Found it more acidic and fizzy than the other beers, but enjoyable none the less. We also tried the Riegele Kellerbier - top fermented specialty, tapped in its naturally cloudy state, and 3 types of malt gives it its unique sweet, creamy mouthfeel and distinctive fruit nose. Yum! We also washed down our meal with some Mozart Water - apparently its drawn from the same deep well the famous composer from Munich drank from. It was icy cold and refreshing and a bit on the pricey end, but I guess now we can claim we drank the same water from the well as Wolf Amadeus Mozart himself! (sorry, forgot to take a pic). Veal schnitzel. This was dreamy delicious with a crisp thin batter, perfectly deep fried moist veal happiness. We each had a simple side salad dressed with a tangy house made honey mustard dressing. The only nod to vegetables this dinner I think lol! Gebraene Forelle - panfried trout with almond and parsley, buttered potatoes and crisp salad in house made dressing. This was one of the most amazing butter pan fried fish I've had in a long time. Fabulously moist with a buttery crisp skin. Soooo good!! 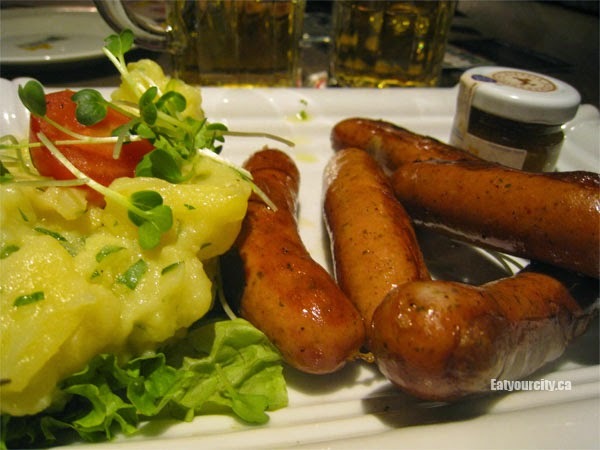 Beer sausages - Riegele beer sausages, grilled, served with potato salad, freshly grated horseradish. This was served with their Riegele beer laced mustard - bought a few small jars home as sadly the store was closed so we couldn't buy large jars to bring back home. The sausages? Deliciously juicy with a light smokey flavor from the grill.. we made them disappear like magic! For dessert, we had the Gestacheltes bock, where a heated rod called a gestachel is swirled in cool dark beer to caramelize the residual sugars, resulting in a still cool beer with deliciously complex, rich, mellow flavours and a warm toasted marshmallow like foam. So. Freaking. Delicious! Here's a video of how our friendly waitress made one for us, after heating up the gestachel with a propane torch! If I can find a nice sweet dark beer (with low hops) back home, I'm totally ordering a gestachel to make these at home!! 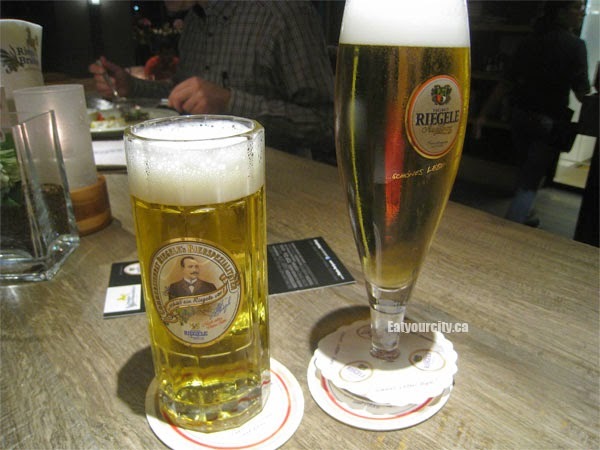 Apparently you can do this with light or regular beers, but it doesn't work as well as dark beers tend to have the higher sugar content resulting in a tastier drink and yummy froth! And it is absolutely amazing. We were already on our fourth beer (I think?) and only due to lack of tummy space we resisted ordering more of them to sip on. Riegele Malt ice cream - made with original Riegele brewery malt, wrapped in bacon with lemongrass puree. This was an interesting concept, though we thought it was too many flavors vying for superiority on our palates. The crispy bacon, while nicely salty savory and bacony overwhelmed the delicate brewery malt flavored icecream which was nice and smooth. The lemongrass puree went nicely with the dessert and helped cut the salty richness of the bacon. 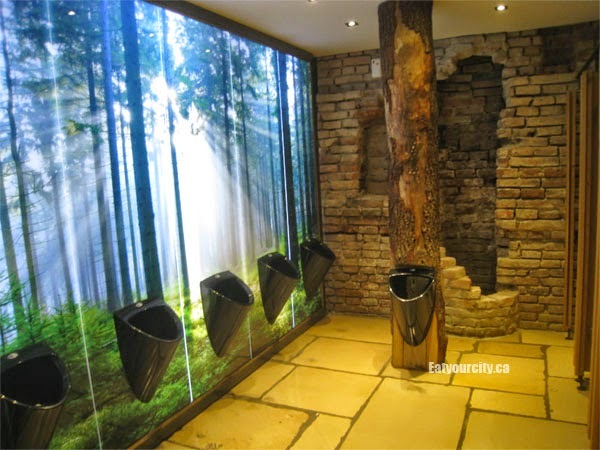 The fiancé broke the seal and took a picture of the men's room, where you can pee in a "forest", or even into a tree LOL! Then we rolled out super full of tasty food, fantastically brewed beer and walked a short distance to the train station to catch a cab back to the hotel for a nice sleep! There's a large outdoor beirgarten in the back, perfect for summer, not as much in the fall when it gets pretty chilly out!